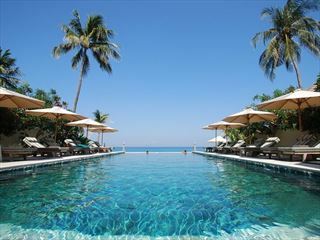 Vila Ombak offers beach water sports, a regular outdoor cinema, a full service spa and two outdoor pools; a resort that is large enough keep you occupied for a while on this paradise island yet small enough to suit this laid-back idyllic location. Stay long enough to try the island’s many beach-front bars and eateries and pick your favourite; you can sip cocktails while you swing over the ocean, sit with your toes in the sand and dine on increasingly sophisticated fresh seafood. The resort has its own glass bottom boat, so you can see the marine wonders (that are in abundance in these tranquil waters) without even getting wet, although snorkelling the turquoise seas teeming with fish and turtles is hard to resist. On dry land, explore the small island on one of the resort’s bicycles, try your hand at fishing or simply kick back on the private beach – this is true island life! 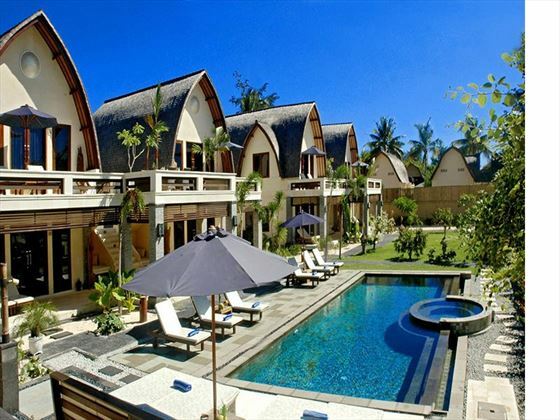 Gili Trawangan is the largest of this island chain off the North West coast of Lombok. Reached by ferry from the east coast of Bali in around two hours. Our transfer service will collect you from your Bali hotel and drop you at the ferry port. The guest will be met from Gili Trawangan harbour and transferred the very short distance by horse drawn carriage. You can also travel from Lombok’s north coast, just 20 minutes by boat. If you fly to Lombok, transfer time is approximately 90 minutes by road to the port on the north coast. 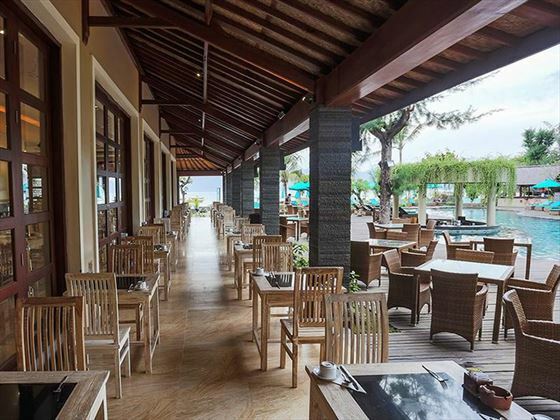 Seahorse Restaurant – Poolside and open for breakfast, lunch and dinner, with a combination of buffet and a la Carte asian and international menus. Blue Beach Bar – adjacent to Seahorse and serving refreshments and cocktails day and night with your feet in the sand. Both Pools have a pool bar to refresh throughout the day. 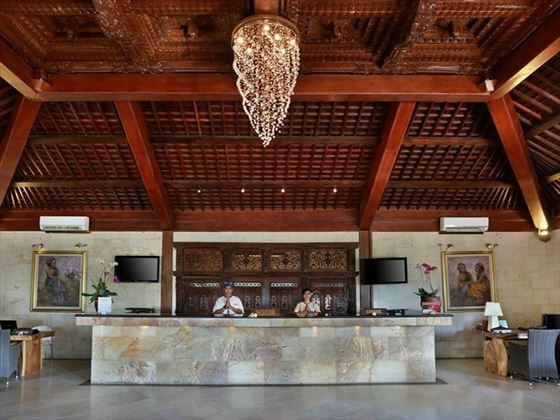 Using a combination of Sasak and Balinese architectural and interior styles throughout the resort, rooms are modern and well equipped. Superior Lumbung Terrace - sleeps 2 in a large double bed or twin beds with a private terrace. Traditional Lumbung Hut – with a distinct Indonesian style, these two storey free standing huts have an outdoor tropical bathroom, enclosed bedroom upstairs and a furnished private outdoor terrace downstairs with large daybed and a hammock. Deluxe Terrace Room – with double or twin beds, close to the pool with modern interiors and a furnished terrace and spacious indoor bathroom. Deluxe Ombak Room – with double or twin beds and a daybed that can be converted to a sleeper bed for up to 2 children (up to 12 years). Deluxe Family Bungalow – centrally located and spacious with a living area, garden and open bathroom with large double bed and a daybed that be converted to a sleeper bed for up to 2 children (up to 12 years). 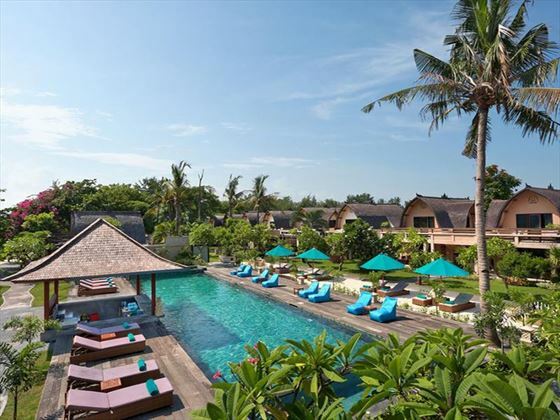 Lumbung Suite Room – with lovely garden and pool views with a private outdoor terrace for dining and relaxing, sleeping 2 adults in a double or twin bed. 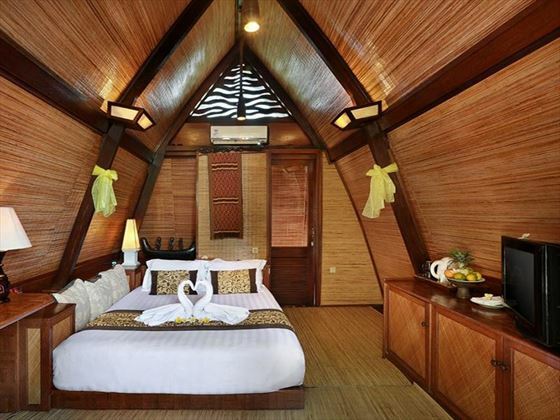 Lumbung Beach Cottage – these rooms have a private balcony a furnished loft and the best ocean views. Please note that the Gili Islands are refreshingly vehicle-free. Motorised traffic is banned by local order, and only the occasional cyclist is likely to nip past. The islands may be small enough to walk around, but it’s worth taking a ride in a cidomo, a mode of transport that’s original to here and nearby Lombok.